The Plenary Council 2020 received more than 2000 submissions during November, matching the number of responses the landmark process had received in the previous five months combined. According to the latest figures from the National Centre for Pastoral Research, more than 31,000 people have shared their stories and engaged with the Plenary Council since the Listening and Dialogue stage launched at Pentecost in late May. Most of the 1300 groups, some of several hundred people, to have responded took part in a Listening and Dialogue Encounter, which is grounded in prayer and contemplation. “While the sheer number of people demonstrating their interest in the future of the Catholic Church is impressive, we’re really pleased to see new groups of people participating as we prepare for the final three months of Listening and Dialogue,” said Lana Turvey-Collins, the Plenary Council facilitator. Trudy Dantis, director of the National Centre for Pastoral Research, said a team of skilled researchers is working hard to keep up with the influx of submissions, which will provide the foundations for shaping the agenda for the Plenary Council sessions in 2020 and 2021. “A Plenary Council is much more than just a survey or a research project,” Dr Dantis said. Ms Turvey-Collins said while the Listening and Dialogue process will officially come to a close on Ash Wednesday (March 6), the fruits of this period of engagement are likely to last much longer. “This Plenary Council process is already changing the way people from all parts of the Catholic Church, and even outside it, engage with their faith, their values, their beliefs, their experiences and their stories,” she said. 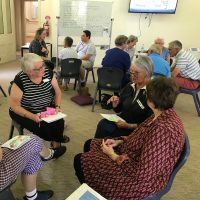 “The practice of dialogue will continue during the next phase – Dialogue and Discernment – in the second half of 2019, when the themes that emerge from this first stage are discussed, contemplated on and prayed about. All people are called to this next stage of discernment. This entry was posted in Plenary Council on December 17, 2018 by ACBC Communications.